The first step in building a pyramid was to choose a suitable site. This had to be on the west side of the Nile because the west was where the sun set and where the dead were thought to enter the underworld. The pyramids also needed to be situated on the high ground, away from the danger of flooding at the time of the Nile's inundation. However, it could not be too far away from the bank because the river would be used to transport blocks of fine quality limestone for the outer casing from Tura, on the other side of the Nile. The site chosen would be at a point on the desert plateau that would proved a firm rock base capable of supporting the great weigh of the pyramid without any risk of cracking. It would also need to be within easy reach of the capital, so that the king could go to inspect the building work whenever he wished. No plans for a pyramid exist. Also there extant plans of tomb in the Valley of the kings. However, the building of pyramids was not a haphazard affair and the measurements were accurate to a high degree. The workers had first to prepare a firm foundation by removing the loose sand from the rock. Then the rock base had to be made absolutely flat. The workers may have done this by building low mud walls all round the base and cutting channels in a grid pattern over the surface. Then they would have filled the channels with water and marked the level it reached. After the water had drained away, protruding rock would have been cut back to the level indicate, and any depressions filled with stones to make a perfectly level surface. Each side of the pyramid had to face one the cardinal points. The builders probably established true north first and worked out the other directions from that. They may have found true north by taking a sighting on an particular star in the northern sky. They would then observe the rising and setting of the star and mark its appearance and disappearance on an artificial horizon. By bisecting the angle thus made, they would obtain a north – south line. They had instruments for drawing right angles so; they would then have been able to find east and west. Next, they had to make the base perfectly square. With all four sides exactly the same length and corners perfect right angles. Some times rocky outcrop was used as the core of the pyramid to save the work.The inner chambers and passages would have been constructed independently and the actual pyramid built around them. Some of the royal pyramid builders seem to have changed their minds about their preferred location of the burial chambers. The inner pyramid would then be built of limestone cut from the desert plateau. When the main structure was finished, the pyramid was completed by encasing it in blocks of finely cut and dressed limestone from Tura. Sometimes granite was used for the lower courses. The precise method of raising the pyramids is not known. Pulleys were not invented until Roman times. However, the Greek historian Herodotus tells of levers being used to raise the blocks from one level to the next. It has also been suggest that workers operating in teams used ramp to haul the blocks into position. 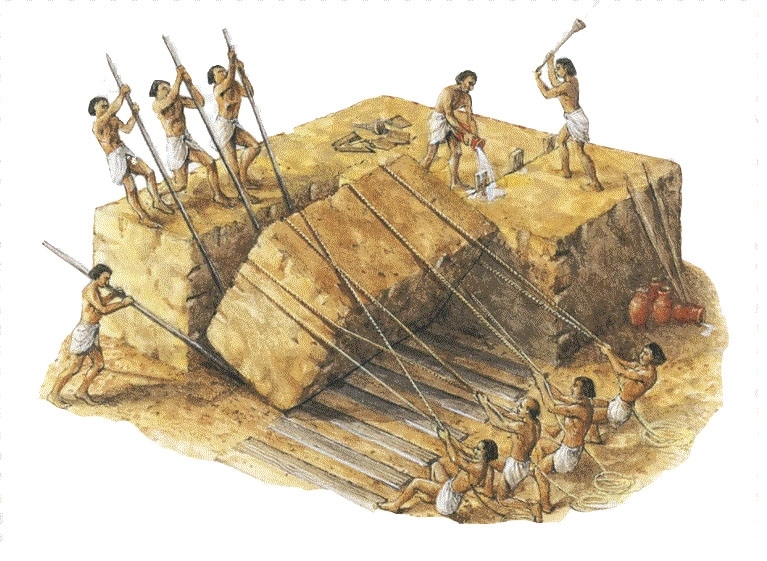 As the pyramid grew in size so the ramp would have been raised to enable the workers to reach the next level. The main problem with this is that the ramp would eventually have been huge as the pyramid itself and would have reached an immense distance into the desert. No trace of such a structure has definitely been identified at any of the various pyramid sites. Another idea is that the ramp would around the pyramid and was dismantled when the pyramid was completed. Construction methods are still hotly debated. 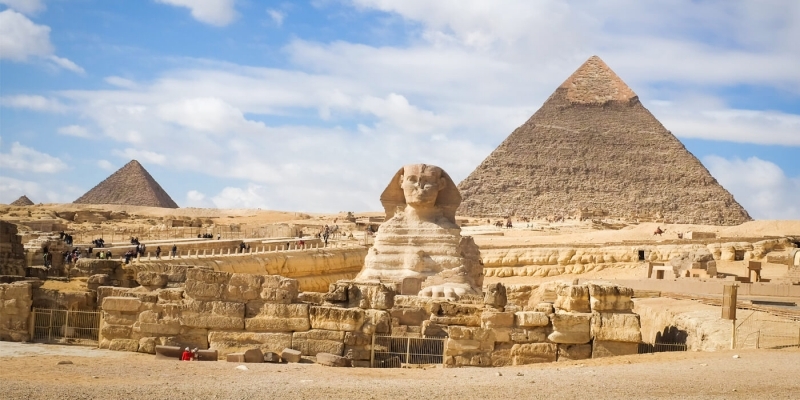 Book one of our Cairo Excusions to Visit the Pyramids of Egypt from here.